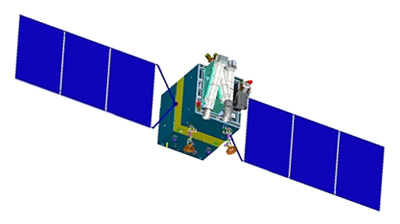 The ZY-3 (Ziyuan-3, 'Resource-3') series represents China's first high resolution, stereoscopic mapping satellites for civilian use. The second satellite is managed by the Satellite Surveying and Mapping Application Center (SASMAC). The imaging payload consists of a three-line camera array and a multispectral imager. The three-line panchromatic camera array to acquire stereoscopic imagery consists of three telescopic cameras with one oriented to the nadir and the other two each offset by 22° forward and backward in flight direction. The stereo mapping camera of ZY-3 has a resolution of 2.1 m for the nadir camera, and 2.6 m for the offset cameras. Swath width is 51 km. The multispectral imager for environmental and vegetation monitoring consists of a three-mirror telescope and a cooled detector system sensitive to four wavelength bands to capture full-color imagery as well as near-infrared data. The ground resolution of this system is 5.8 m.
The first satellite, ZY-3 01, was launched in January 2012 on a CZ-4B rocket. ZY-3 02 reached orbit in May 2016. 3 panchromatic cameras, 1 multispectral imager.